A 1950’s era entertainment venue is the latest project The Energy Alliance Group of Michigan is developing. The client, reflecting a growing national trend, has placed renewable energy high on the list of what’s important for upgrading their facility. The phenomenon of client demand for renewable energy has become a driving force in the rapid changes taking place in the arena of energy. Politics, legislation, lobbying and government subsidies assume minor roles compared to the rapid change customers create when it comes to altering the source of energy. Businesses, both large and small, share similar concerns when it comes to reducing volatility in their energy costs. Any sudden spike in pricing dramatically affects business profitability. One of the many benefits of renewable energy is predictability in pricing – it’s not a commodity that tends to go up in price as demand increases or supply dwindles. In most cases the costs associated with renewable energy are fixed, predictable and free of sudden fluctuations. While a predictable cost of energy is important, there are other benefits of renewable energy that add to it’s appeal and contribute to rising customer demand. Many are simply the result that renewable energy does not require burning a resource (coal, oil, propane, methane, etc) to create energy. EAG’s client, while interested in all the benefits listed above, also wants to to showcase their corporate responsibility to the many customers they serve. The facility, as well as the adjacent property, will highlight visible reminders of corporate choices. 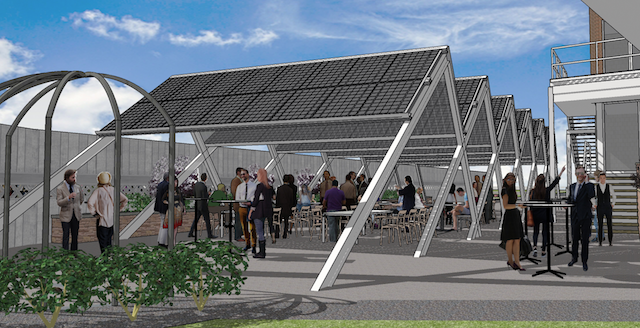 These include geothermal sourced energy, solar panels over the picnic area (see prototype pictured above) as well as solar panels on all of the parking canopies. Inside the building, many measures will be incorporated that reduce the use of energy while at the same time the upgrades help convert to on-site production of energy. While the resulting upgrades will not eliminate the need for traditional grid energy, there will be a dramatic reduction in wasted energy as well as the need for energy from off-site sources. This will be an interesting project to follow and EAG looks forward to showcasing it once it goes public. Editors note: The most frequent question raised when renewable energy is being considered is often “how will we pay for it?” While there are many options to choose from one energy specific choice is known as Property Assessed Clean Energy. EAG’s Vice President, Curt Monhart, is hosting a team of experts who will be presenting a program titled – Making Energy Efficiency Upgrades Affordable. To learn more about this free event you can go HERE.